• Jones was named Most Outstanding Player of the Outrigger Resorts Invitational hosted at Hawai’i, leading the sixth-ranked Huskies to a 3-0 weekend, including a career-high 22 kills in a win over the 14th-ranked Wahine in the tourney finale. • First-career weekly honor and 58th all-time for Washington. • Benson was named to the Nike Invitational All-Tournament Team after leading the field with 45 total digs and 5.00 digs per set. Committed just four reception errors in 75 chances over the Ducks’ four matches this week. • Second-career weekly honor and 31st all-time for Oregon. • Bajema led the Husky block during a 3-0 weekend in Honolulu. She had at least six blocks in all three matches, averaging 1.73 per set for the weekend, also adding 1.73 kills per set as well. Had nine kills against the Rainbow Wahine and also served the first two aces of her career in the sweep of Northern Illinois on Saturday. 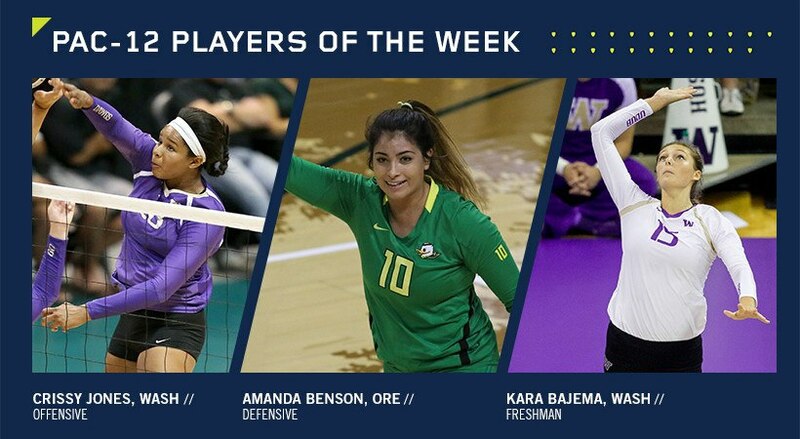 • First freshman weekly honor of the season for Bajema and sixth all-time for the Huskies. Offensive: Kendra Dahlke, ARIZ; Oluoma Okaro, ASU; Alexa Smith, COLO; Taylor Agost, ORE; Inky Ajanaku, STAN; Jordan Anderson; UCLA; Elise Ruddins, USC; Adora Anae, UTAH; Hailey Bethune, WSU. Defensive: Penina Snuka, ARIZ; Halle Harker, ASU; Naghede Abu, COLO; Inky Ajanaku, STAN; Taylor Formicio, UCLA; Jordan Dunn, USC; Courtney Schwan, WASH; Taylor Mims, WSU. Freshman: Mmachi Nwoke, ASU; Jolie Rasmussen, ORE; Morgan Hentz, STAN; Torrey Van Winden, UCLA; Khalia Lanier, USC; Bailey Choy, UTAH; Alexis Dirige, WSU. Courtesy of Pac 12 Athletics.